Captivity? I don’t think so! I didn’t plan to get divorced. I didn’t plan to lose custody of my son. I didn’t plan to destroy my life. No one does. My life was hijacked, and I lived each day in captivity, with seemingly no way of escape and no hope of change. But I’m not living that life anymore—I overcame my victim mentality. Today the hijackers are gone, and pain and hopelessness are long forgotten. Captivity? I don’t think so! Are you being held captive by hijackers such as addiction, abuse, fear, rejection, sickness, or poverty? Do you feel as if your life is not your own—that someone or something else is in charge? Instead of identifying how it happened and correcting your mindset, you may be wasting precious time wondering, Why me? Through her own life experiences, author Melanie Mitchell candidly reveals the kind of thinking that leads to victimhood. Not only is her true story of victory over the “why me” mentality inspiring, she also gives you practical, empowering steps to overcome all of your challenges. 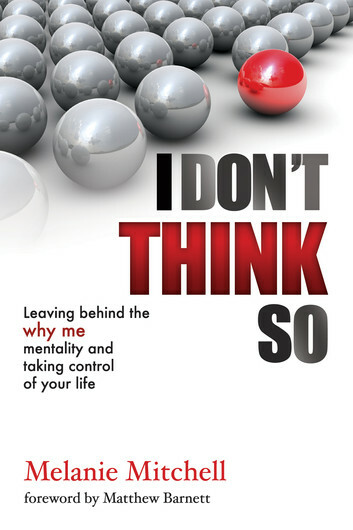 Can you change your thinking and take control of your life? Yes! I think so! Chapter 13 What Gives You the Right? Life is the most precious gift the Lord has given us.We are called to prosper and lead a fulfilled existence.However, even the most devoted Christian will face difficulty, heartbreak, pain, and sorrow. There are so many blessings that the Lord places in our lives, but when trials and setbacks occur, it is so easy to lose focus of the amazing blessings He has given us.We are all human, and we all fall short of the glory of God. Although we all experience depression and helplessness, it is harmful to stay in such mindsets. There is nothing more powerful than hope, and the lack of hope can destroy people from the inside out, robbing them of their true potential.The Lord is at work all around us, guiding us and shaping us. Life will come with difficulty, but such things are not meant to last.The trials and setbacks we go through are meant to teach us lessons and build our character, bringing us closer to God. For many people, it seems impossible to escape a life of heartbreak. I have met so many people with amazing potential and the most genuine personalities,but they are stuck in a cycle of hopelessness and despair.Freedom is so near to these people, but it is a concept that seems impossible to them. Once people give in to despair, it can grow and overtake their lives. A victim mentality is corrosive to the soul, and it can be very hard to escape, like quicksand pulling you down. The good news is that the redemptive power of God’s love is available to all of us. Even if the negative mindset seems to be overpowering, it is still possible to change your way of thinking, take control of your life, and flourish in the comfort that God’s hand is at work in your life. As it says in Philippians 4:13,“I can do all things through Christ who strengthens me” (NKJV). God’s grace is welcome to all of us.When you become aware of the victim mentality, it can be overcome. Melanie Mitchell is a living testimony of how the presence of God can break down a victim mentality and restore a person to greatness. She has gone through more heartbreak than anyone should have to deal with; and although it felt like her life was being hijacked, the Lord never left her side.Through her life experiences and years of service to the ministry, she has helped others overcome the circumstances that tried to rob them of their joy. Melanie Mitchell has a true talent for using her past and the lessons she learned to enrich her own life as well as the lives of many others.